It was a long walk out of the Maracanã and a quiet one too. From the dressing room to the door, Spain’s players had to weave their way out. Most of them walked the route in silence, passing by in front of the media, eyes down. They had just produced the country’s worst performance at the World Cup, at a tournament they had turned up to as champions. They did not much feel like talking and many of their inquisitors did not much feel like asking. Some of those in the national media just watched them pass, almost as if paying their respects. Others sought solace or tried to provide it. One word was repeated often, almost whispered as they walked past. “Ánimo,” they said and not much else. Ánimo is somewhere between sorry and chin up, and it is wholly inadequate. Back home in Spain, Marca were preparing their front cover. It showed Andrés Iniesta alone, leaving the pitch sadly. “The End”, the headline said in English. The way they left the stadium was much the same. Normally, the mixed zone, where players talk to the press after games, is a noisy scrum. Not this time. Under the stand it was quiet like never before. As they snaked round the room, some did stop to offer their thoughts. “We have been at the very highest point,” Iniesta said, “now we are at the very lowest.”Defeat to Chile after their humiliation by Holland meant Spain had become the fifth world champions to fall at the first hurdle four years later. “We’re sorry,” The captain and goalkeeper added. “Don’t be, you have given us so much,” ran the editorial in AS. “It was lovely while it lasted,” the headline said. A picture of sadness was accompanied by three pictures of joy: Casillas and his team-mates lifting trophies in 2008, 2010 and 2012. No national team has had a run like this. But no one expected them to collapse like this either. It was cruel. 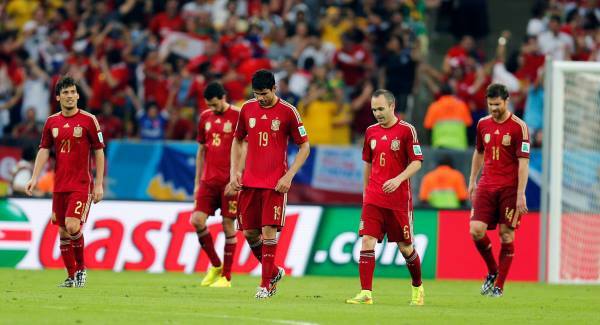 “This group of players didn’t deserve to end like this,” Casillas said. “Is this the end of an era?” he was asked. “Things are going to change. Eras end with defeats … and this was a painful defeat. Now we’re going home,” he said, beginning the long walk out of there and out of the World Cup.